So, June was a month of firsts! 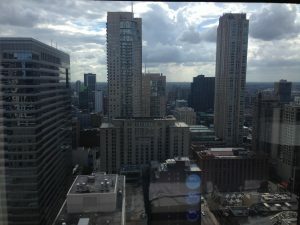 I got to go to Chicago. 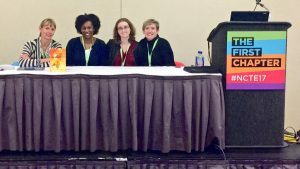 I got to attend the American Library Association’s Annual Conference. I got to meet my editor, Kristin, plus a lot of great folks from Albert Whitman. 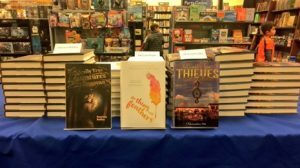 And, best of all, I got to meet and hang out with a bunch a debut authors! 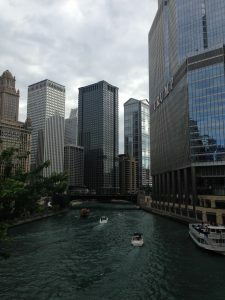 I stayed with a couple of other Class of 2k17 authors at the Marriott downtown where we had a great view of the city – and killer access to The Riverwalk and The Magnificent Mile. 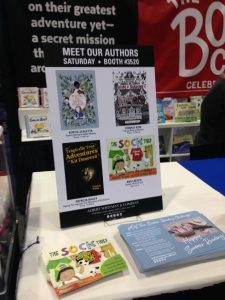 My ALA experience started with a book signing at the Albert Whitman booth. The line went on and on until we ran out of books and had to pull one off the shelf for a kid who was bummed to see them all gone. Can’t beat that! Everyone was so sweet! And I even got to see (and pose with) my rock star local library director. Later that day I got to hang out with the Albert Whitman crew at the American Writer’s Museum for a cocktail party and celebration of the 75th anniversary of The Boxcar Children. 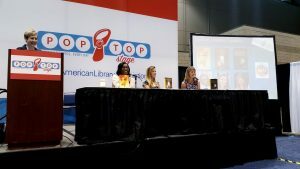 On Sunday, I shared the PopTop stage with fellow Class of 2k17 debuts, Leah Henderson and Jodi Kendall, where we talked about setting as a character in middle grade fiction. Every moment at ALA was a blast. I met so many great people, saw some beautiful sites, and came home with a pile of great books. A truly perfect weekend just hanging out being an author. I’m coming to Portland for an author event! 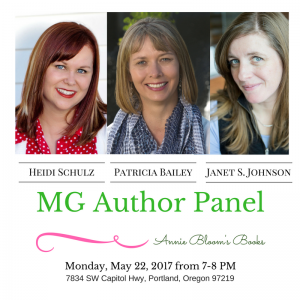 I’m so excited to be on a middle grade author panel with Janet Sumner Johnson and Heidi Schultz! We’ll be at Annie Bloom’s Books in Portland, Oregon on May 22 talking about the real-world inspiration for the characters, friendships, and adventures in our books. We’ll discuss our writing process and how life inspires our creativity, leaving time for a Q&A session with the audience. If you’re in the area, I hope you’ll be able to make it. 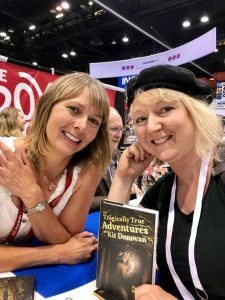 This will be my first out-of-town author event since THE TRAGICALLY TRUE ADVENTURES OF KIT DONOVAN has been out in the world and I’m kind of nervous. I would be great to see some familiar faces! 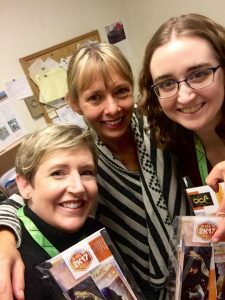 My awesome local library hosted an author discussion panel this month – and my new super amazing writer friend Janet Sumner Johnson asked me to be on it. I got to meet the super fantastic Laura Shovan and the three of us talked about our wacky weird journeys from writer to published author. 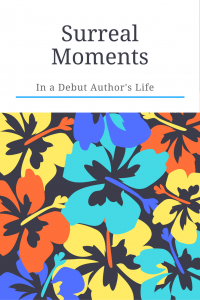 We covered everything from writing the first draft to getting a publishing deal – and all the joys and frustrations in between. It was fun. Fun to be part of – and extra fun to hear Janet and Laura present. As Sweet Sixteeners, they are pros at this – so in addition to getting to sit at the table with them, I got to watch how they do this whole author presentation thing. And I learned a lot. 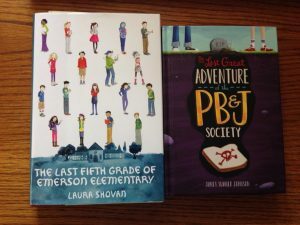 If you’re looking for some wonderful middle grade reads, check out their books, THE LAST GREAT ADVENTURE OF THE PB&J SOCIETY and THE LAST FIFTH GRADE OF EMERSON ELEMENTARY. Extra big thanks to the Klamath County Library for hosting the event – and to Janet and Laura for inviting me to be part of it. You’ve just gotta love the middle grade writing community. I had the best time speaking at the High Serenity Ranch Writer’s Retreat in Sprague River, OR on Saturday, Oct. 29. Sponsored by Klamath Basin Writers, this event brought writers of all interests together in a lovely setting to write, share, and get inspired. 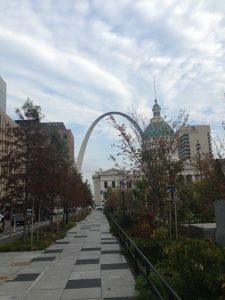 I ate beautiful food, talked with wonderful people about writing and creativity and life, wrote short pieces in response to fun prompts, and even put together a plan for my writing goals. 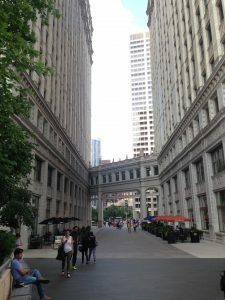 And I got to share my experience on this writing road – from dealing with rejections, figuring out next steps, and finding the the very best friends and colleagues to share the journey with. 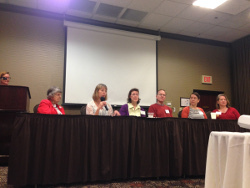 I’m so happy they asked me to present and gave me the chance to meet so many wonderful writers. Thanks to everyone who attended – and extra love to Laura, Perri, and Jo for putting the retreat together and letting me tag along. 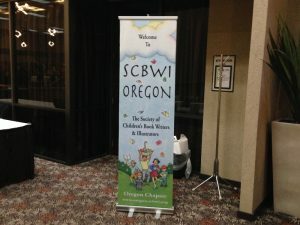 Last year I almost didn’t go to the Oregon SCBWI Conference. I even told my buddy in Portland I wasn’t going to go. Not this year. I was just not up for it. Then, months later, something – the same something that tells me when it’s time to start a new story or go get that mole checked out – said “You should go, and you should do a manuscript critique.” I realize this may sound strange if you’re not someone used to helpful brain-based voices telling you what to do. But, I’m a writer, and I tend to listen to the voices in my head; they’ve never steered me wrong. So, I went to the website. I looked at the pictures of agents and editors still taking manuscripts; I read their bios; and I picked one. One with a friendly face. One who grew up in a small town in Oregon. One who looked like she’d be easy for someone like me to talk to. Then I paid my fee and sent in my pages. On the last day of the conference, during the last consultation spot, I met with Kerry. We talked – but not about the manuscript. We talked about growing up in Oregon. About small towns and food trucks and trips to the coast. She told how much she loved my pages. She told me to send her the full. So, I did. And she loved it. And she became my agent. All because of the Oregon SCBWI Conference. This year I signed up immediately after I found out my book sold. It was my “you’re really a writer now” gift to myself. It was also a chance to say thanks. Thanks to my friends who I knew would be there, and thanks to the ladies who work so hard putting the event together. Plus, Matt de la Pena and Victoria Jamieson were going to be the keynote speakers. Who would want to miss that? The conference was wonderful. I met new friends and hung out with old ones. 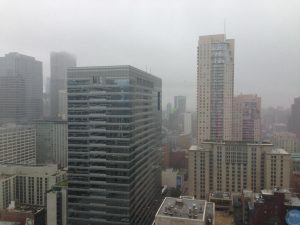 I took a ton of notes – because every presenter had such good advice to share. It was so good, that for all of Saturday it was easy to just concentrate on listening and learning and being inspired. As long as I didn’t look at Sunday’s schedule – and the panel scheduled for the morning – everything was cool. Yep, that’s my name in the program. Right t here with the likes of Rosanne Parry. She with her four novels, and me, with my teeny tiny book deal. The title of the panel? Local Success. I’m a much better listener than I am speaker. The hardest part of working as a teacher was talking in front of large groups. Thankfully, no one really wanted to hear about me. 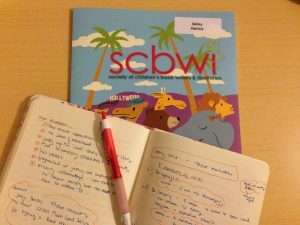 I could talk about SCBWI. About the great people I met there (like Catherine who took the panel picture). About how the organization helped me. And about how supportive the writing community is. So that’s what I did. Even though I was mostly terrified. Even though was certain I was not talking into the microphone right. Even though I was not 100% sure that what I was saying wasn’t coming out in some sort of high frequency gibberish. And, I survived – without breaking out in hives or falling over in a freaked-out faint. Which pleased me. But what pleased me more was the people who came up to me after. The people who said thank you. The one’s who said my story made them feel like they could meet an agent and get a book deal, too. Which is exactly what I wanted to do. I wanted to dispel the myth that you have to be super cool or super connected or super important for this writing thing to work out. I wanted people to get that if I could do it – if I could sign up for a consult. If I could drive 5 hours to better my craft. If I could be brave and talk to people and share my work and ask for feedback, they could too. Because I really think what I said is true. Success lies in a succession of tiny brave steps. Writing the book. Taking classes. Asking questions. Chatting with strangers. Sending out the query. Meeting the “scary” New York people. And generally being kind and open and hopeful. 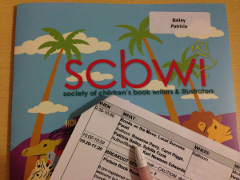 SCBWI is a good place to practice all of that. Plus you learn a ton – and even meet amazing writers like Matt and Victoria, and Rosanne. Who could ask for more?